Glass beads for whit and yellow lines are effectively distinguished, supporting the use. It won`t affect paint`s color but ensure different reflective light colors to help drivers distinguish line`s colors. If customers need other colors such as red, blue and green etc. we also can produce special colors according to customers` requirements . Road markings are among the most efficient and most economical means to safely guide traffic. The contrast between the pavement and the pigmentation of the marking material provides clear visibility of stripings under daylight conditions.However, the true quality of a road marking is revealed under less favorable light and weather conditions, i.e. at night, with fog or when it is raining. Here the optical phenomenon of retroreflection plays a crucial role in maintaining the guiding function of the stripings to ensure safe driving. And retroreflection requires micro glass beads. Traffic Paint Reflective Glass Micro beads beads embedded in the marking material a vehicle`s headlight beam is returned to the driver`s eye, which results in a [light-up" effect of the striping. This is the decisive plus for road safety. Reflective Road Marking Spherical Glass Beads enhance nighttime visibility of pavement markings, even on the darkest roads. Work well with both traffic paint and thermoplastic on roadways, parking lots, thoroughfares, loading docks and airport runways. Variable sizes and specific tate spec beads are available, contact us for more information about these Glass Microshpere Glass Beads Road Marking. Retroreflective highway signs and lane markers use special kinds of paints and materials. Most retroreflective paints and other pavement marking materials (PMM) contain many thousands of glass beads per square foot that are bonded to the highway with a strong binder. Instead of scattering light, as normal paints do, retroreflective paints containing glass beads turn the light around and send it back in the direction of your headlights. Figure 3 portrays how glass beads perform retroreflection. For beads to retroreflect light, two properties are necessary: transparency and roundness. Beads made of glass have both of these properties.The need for transparency and roundness can be seen to be important if you follow the path of light as it enters a bead embedded in an applied roadway marking. The glass bead must be transparent so that light can pass into and out of the sphere. As the light ray enters the bead it is bent (refracted) downward by the rounded surface of the bead to a point below where the bead is embedded in the paint or PMM. Light striking the back of the paint-coated bead surface is reflected from the paint surface, with only a small fraction of the light going back toward the illumination source. The Thermoplastic Paint glass beads are applied to pavement marking materials in one of three ways. They can be premixed in marking materials before application, or they can be dropped or sprayed into the wet paint directly behind the paint sprayer, or a portion can be dropped onto premixed two-part epoxy or thermoplastic materials. The top surface of beads is enveloped by the paint, with the wicking action of the paint rising up to above the midpoint of the bead. This provides two actions. It locks the glass beads into the paint and allows the paint to act as a diffuse reflecting surface for retroreflection, with the paint color affecting the color of the retroreflected light. The light entering the glass bead is bent and focused towards the back of the bead and reflected back out towards the headlights and driver. A good application of beads results in the top layer of Micro Glass Beads For Thermoplastic Road Marking being embedded to about 60% of the diameter of the bead. 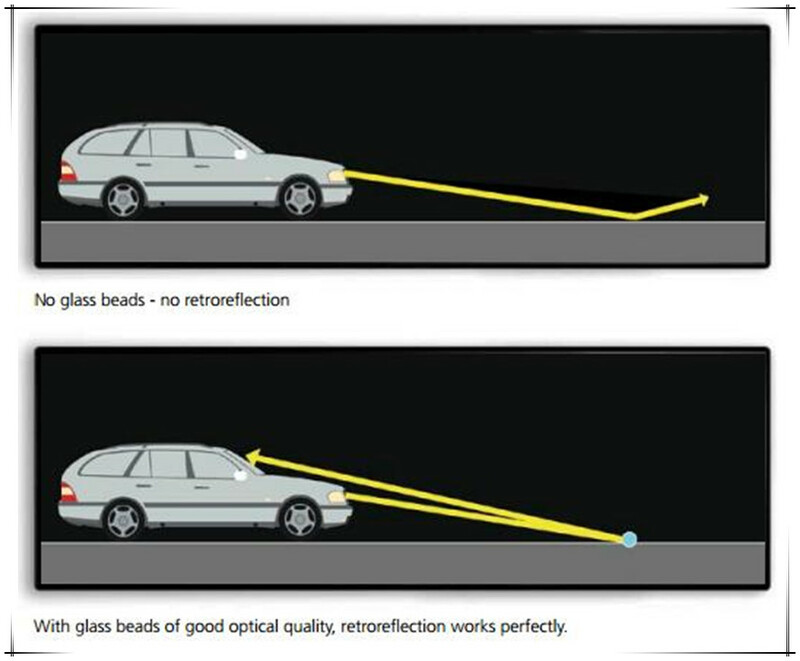 There should be consistent quality of both glass beads and paint so that the paint thickness and bead coverage promotes even retroreflectivity across both directions of road travel. Too little paint results in under-embedded beads. This will result in improperly anchored beads that will fall out prematurely, and thus will not be effective retroreflectors. Under-embedded beads cause a large percentage of the light that enters them to exit out the back. Too much paint results in over-embedded beads. While over-embedded beads may remain in the binder, light cannot enter them and thus no retroreflection can occur. The bead`s Refractive Index (RI) is an important physical parameter.The higher the RI of the bead and the fewer impurities in the glass material, the more costly it is to manufacture.The RI is a function of the chemical makeup of the reflective glass Beads. The higher the RI, the more light is retroreflected. Beads used in traffic paint commonly have a RI of 1.5. There are some 1.65 RI 5 beads used with thermoplastics, and 1.9 RI beads are often used in retroreflective airport markings. Despite the increased brightness gained with the higher refractive index, most state and local highway agencies find it is more cost-effective to use 1.5 RI beads. road marking glass beads range in size from 60 micrometers (0.0024 inches) to 850 micrometers (0.034 inches). Bead size is usually expressed in terms of U.S. sieve number, or the size of mesh screen that a bead will pass through. For example, a U.S. Sieve Number 20 will permit beads with a diameter of 840 micrometers (0.033 inches) or less to pass through the mesh, whereas a Number 200 mesh will allow only those beads of 74 micrometers (0.0029 inches) or less to pass. A typical application of drop-on beads will use from 20 to 100 mesh. The specified mix of bead size (called in the industry gradation) is usually a local policy decision based on several factors. Looking for ideal Spherical Glass Beads Road Line Manufacturer & supplier ? We have a wide selection at great prices to help you get creative. All the Thermoplastic Paint Road Glass Beads are quality guaranteed. We are China Origin Factory of Micro Glass Beads For Thermoplastic. If you have any question, please feel free to contact us.